Oracle announced recently at OOW 2011 the release of the brand new re-engineered OEM Cloud Control 12c (c stands for the cloud). This is the first product from the 12c family of products intended for the cloud. At present, as of the time of the writing of the article, OEM 12c is only available for download for Linux x86 (32bit) and Linux x86-64 (64bit) from OTN. In the article you will have a look at how to prepare the OEL 6.1 and subsequently install OEM 12c on OEL 6.1. 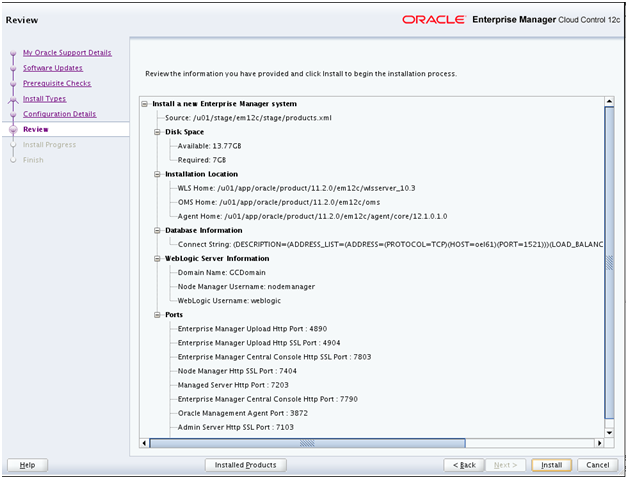 OEM 12c requires a repository database. In the article Oracle 11.2.0.3 database is used a repository. I will provide pointers to MOS or Oracle documentation for supported OS and repository database versions. Always check the certification matrix as it is updated as new supported OS are added and new inter-operability database patches are added. contains a list of prerequisites for OEL and repository database. The complete set of OEM 12c documentation is available here. In the article the following software products will be used. 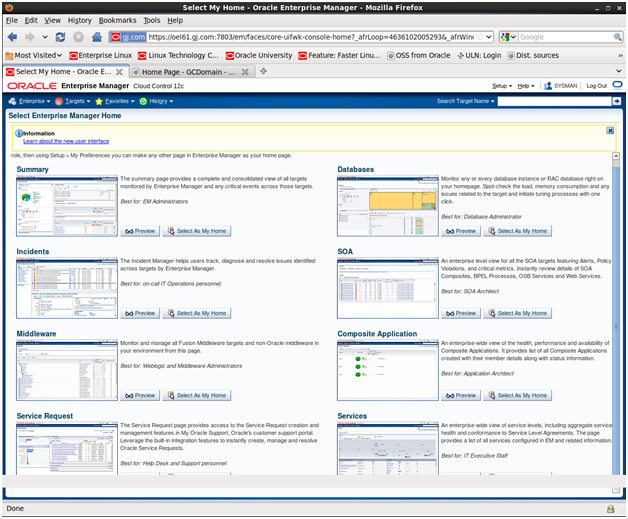 Oracle 11gR2 (11.2.0.3) for Linux (x86-64). Patch 10404530. Download from MOS here. 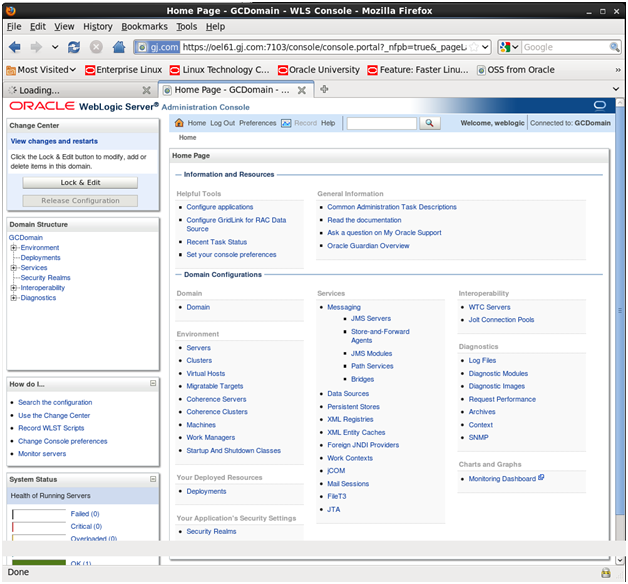 Oracle Enterprise Linux OEL 6.1(x86-64). Download from here. Oracle VM VirtualBox 4.1.4. Download from here. 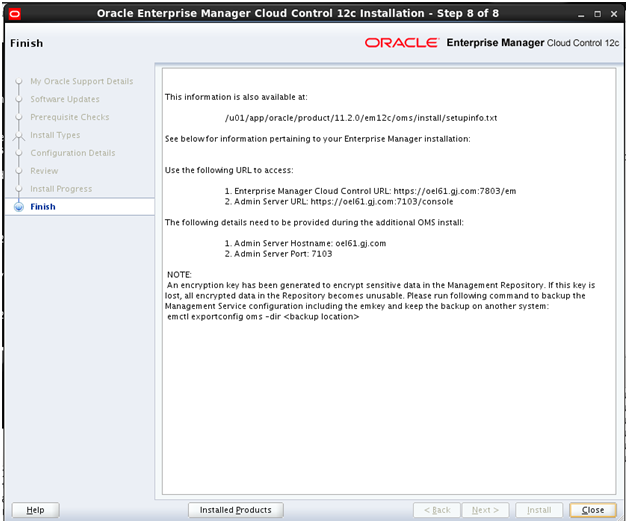 Enterprise Manager Cloud Control 12c Release 1 (12.1.0.1). Download from here. In the article I will reuse the OEL61 VM created here to install OEM 12c and will outline the steps to follow if you start from a new OEL 6.1 installation. 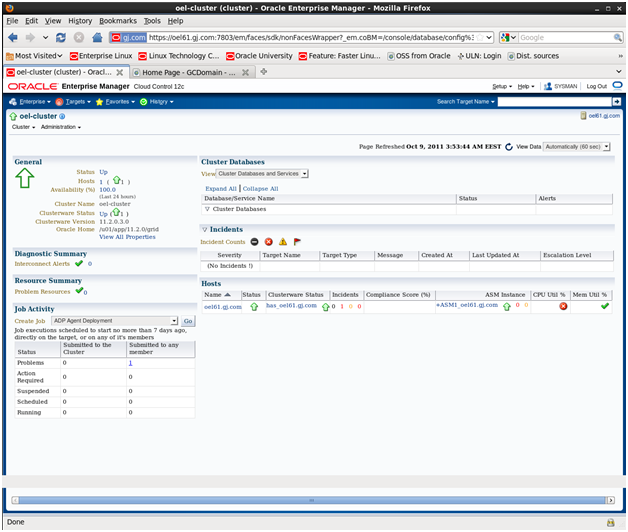 Proceed for OS configuration and OEM 12c installation once you are on supported OS and have a supported Oracle RDBMS database for an OEM repository. 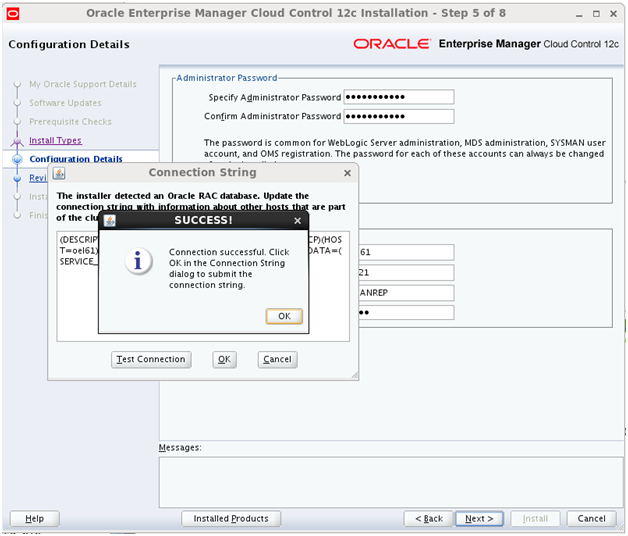 Installation of OEL 6.1 and Oracle 11.2.0.3 GI and RDBMS and creating RAC database is covered here. A complete prerequisite check list can be found here. 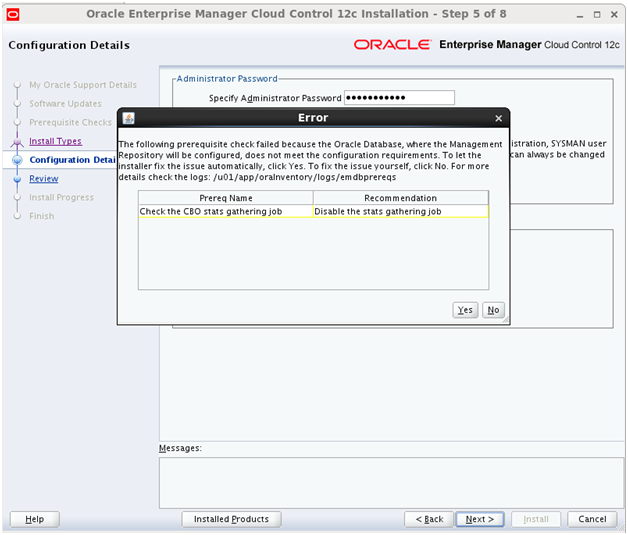 In the article an assumption is made that an Oracle RDBMS is created for a repository prior to OEM 12c installation. The database in this article is RAC 11.2.0.3. I increased the OEL61 RAM to 8GB and restarted. Create a VM or choose a server accordingly sized. I did a full OEL6.1 install and additionally added glibc-devel-2.12-1.25.el6.i686.rpm as OUI was asking for glibc-devel-2.5-49.i386.rpm. Install the following packages or later from OEL media if you have a fresh OEL 6.1 install. The kernel parameters were already set for Oracle RAC 11.2.0.3 deployment and met the OEM 12c requirement for kernel.shmmax parameter to a value less than 4 GB. Value kernel.shmmax = 2074277888 is within the OEM 12c requirements. Modify as root /etc/security/limits.conf to make sure that you set a minimum of 4056 max open files. This is the content for Oracle RAC 11.2.0.3. Only the values in red a required for OEM 12c. OMS will complain and display a warning if descriptors are not properly set. See the Annex 1. Since I am installing it on a RAC node I have oracle user already created. 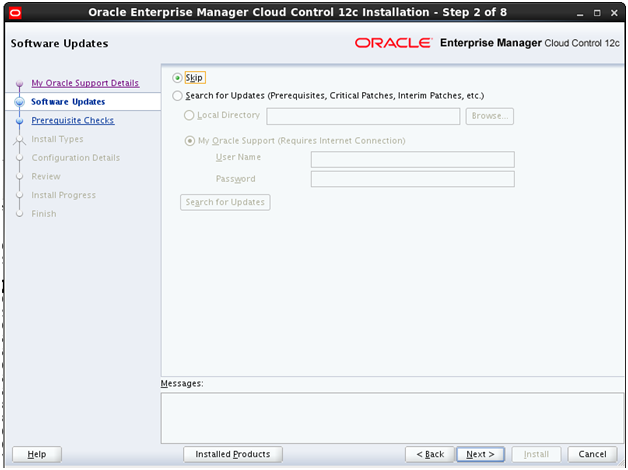 OEM 12c can be installed using that oracle user. Assuming that Oracle RDBMS is created for OEM 12c repository you can install OEM as Oracle owner or any user that is part of oinstall and dba group. As part of GI and RAC installation I did. For OEM12c you can create the following groups and users. 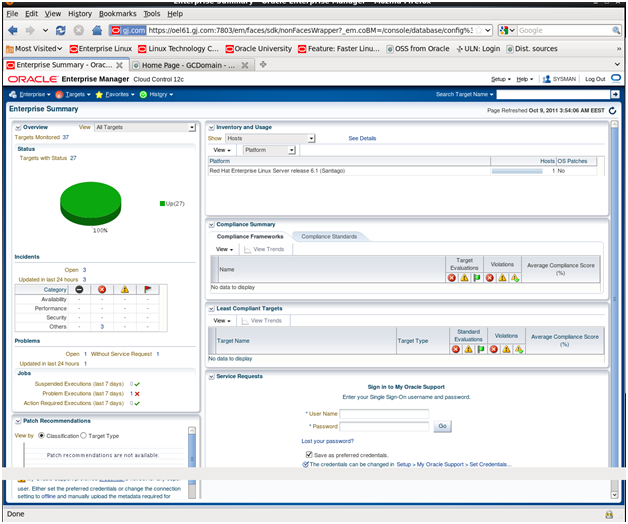 Existing database version requirement See MOS or Oracle OEM 12c documentations. If you are on 11.2.0.2 or 11.2.0.3 Oracle database, then no interoperability patching is required. Make sure that the bash profiles for the oracle and grid users contain umask 022. Make sure that you use unique host names and static IP addresses. Do not use Virtual IP or Virtual hostnames or SCANs. Make sure that there is no existing OEM Database Control or Grid Control or Cloud control repository. Remove an existing OEM DC repository using the following command. Remove anexisting OEM GC or OEM CC repository of a failed installation using the following command. 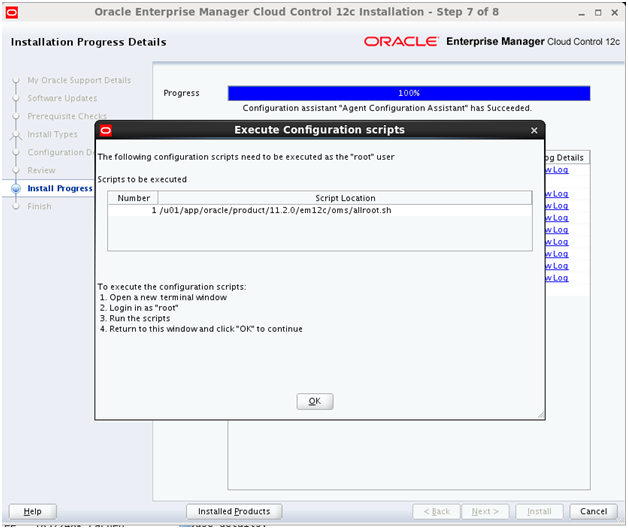 Create a directory /u01/app/oracle/product/11.2.0/em12c for OEM12c installation. 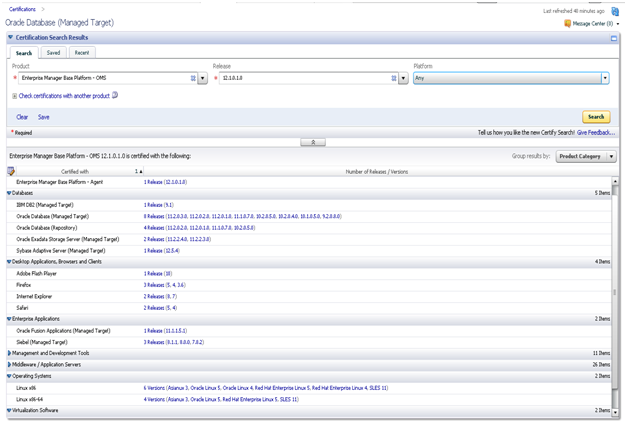 Unzip the OEM12c binaries in a stage directory. For OEM12c installation modify the tnsnames.ora entry for the RMANREP service or whatever name you will use to specify the local physical host (RAC only). Added the red lines as per OUI suggestion. Make sure that the Repository database is properly configured. After setting the init parameters in spfile bounce the instance. It is recommended to set the redo log files size to at least 300MB and to configure at least 3 redo log groups. Do not use a shared file system for Oracle Inventory. Run the OUI from the staging area by issuing ./runInstaller command. Deselect the option for receiving security updates and press Next to continue. Select Skip and press Next button to continue. Review the prerequisite checks. The warning is due to missing glibc-devel-2.5-49.i386.rpm. Instead glibc-devel-2.12-1.25.el6.i686.rpm is installed. Press Next to continue if this is the only problem. Specify the installation location for Middleware home as indicated from Configure OEL 6.1 in step 11. Press Next button to continue. Specify the password and database connection details. Press Next to continue. This is already done in Configure OEL 6.1 step 13. Test the connection and press OK. Confirm that test is successful. Will leave as it is. Review the summary of the installation. At the end you are prompted to run scripts as root. Run the scripts as root. Prepare start and stop scripts. Verify the start and stop scripts. Note that file descriptors need to modified as per Configure OEL 6.1 step 3. Starting agent …………………………………………………………………………………………………………… started but not ready. 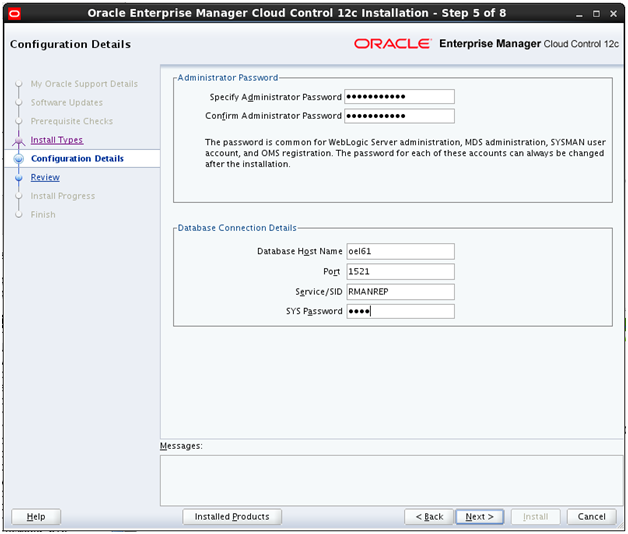 Enter sysman and the password that you specified during OEM 12c installation with OUI. Drill down to Enterprise Summary. 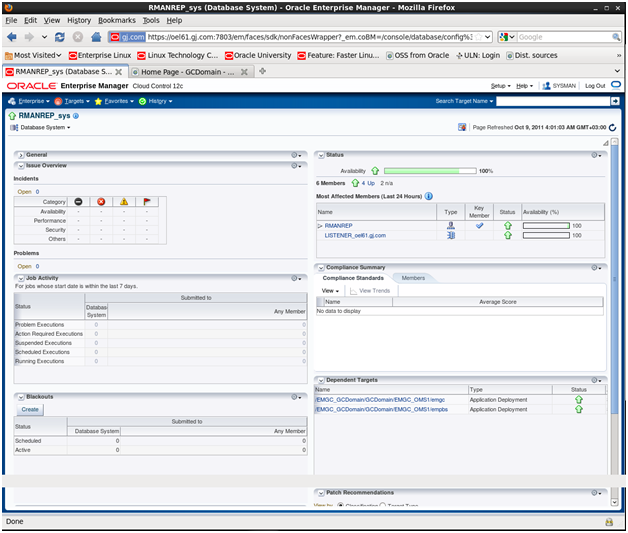 Go to the database RMANREP used for OEM CC 12c repository. 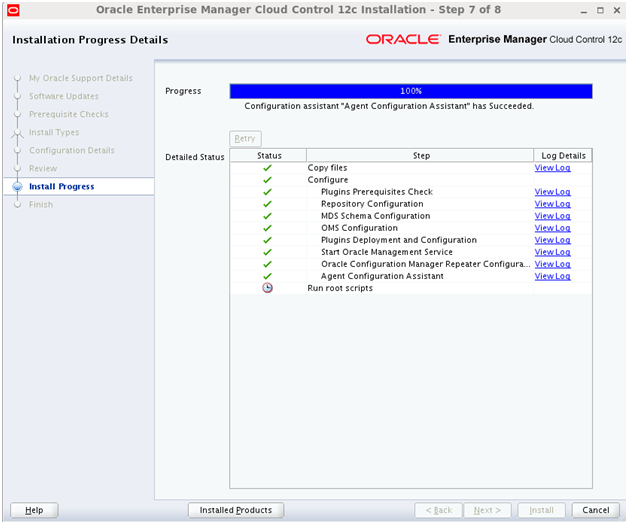 This concludes the OEM 12c Cloud control installation. 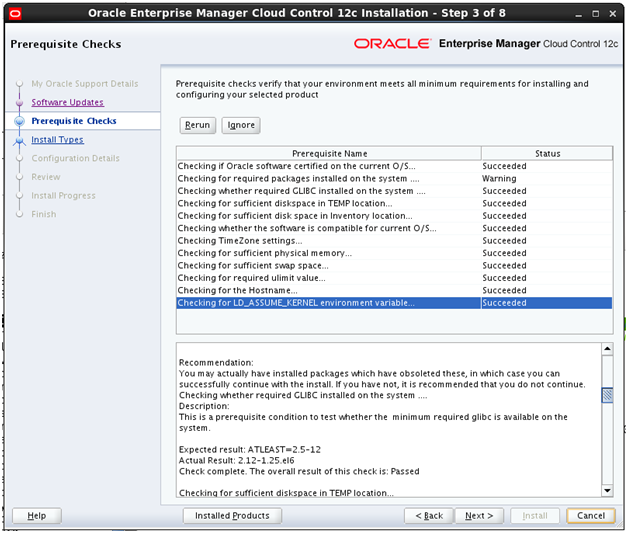 You looked at OEL 6.1 configuration in order to meet the prerequisites for OEM CC 12c installation. 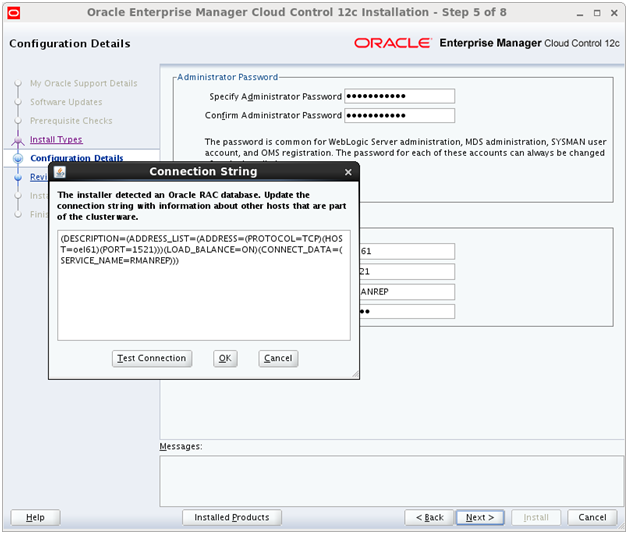 You installed OEM CC 12c interactively using OUI. INFO: This operation is being logged at /u01/app/oracle/cfgtoollogs/emca/RMANREP/emca_2011_10_05_18_41_11.log. please help me to finish this. that is, if installing on oidnode2 specify oidnode2. If installing on oidnode1 specify oidnode1. Thank you for your reply.thank you very much. i finished my installation. 1.now i can able to log in oem but i’m tried to log in console by using same password it say’s username and password authentication failed. EM Configuration issue. /home/oracle/oemdb/product/11.2.0/db_1/teamdblin.alshaya.com_oemdb not found. 3.I need to configure agent in another db reside in separate server. 2. What is the status of the OMS and the agent? Further reading seems to point to an incorrectly configured hosts file but no specific example on what the entries in your hosts file should be. PING oel61.gj.com (192.168.2.11) 56(84) bytes of data. PING 192.168.2.11 (192.168.2.11) 56(84) bytes of data. Although I added the hostname in DNS it should not be a deal braker. Look at MOS. There are few notes. Look at the others as well. Is it better to install on OEL 5.5 ? or how to verify that plugins are installed? You can use any supported and certified platform. Look at MOS for the list. EM Configuration issue. /u01/app/oracle/product/11.2.0/db_1/orion.11i.com_ORCL not found. What does Mr. Google and Mr. MOS say about it ? 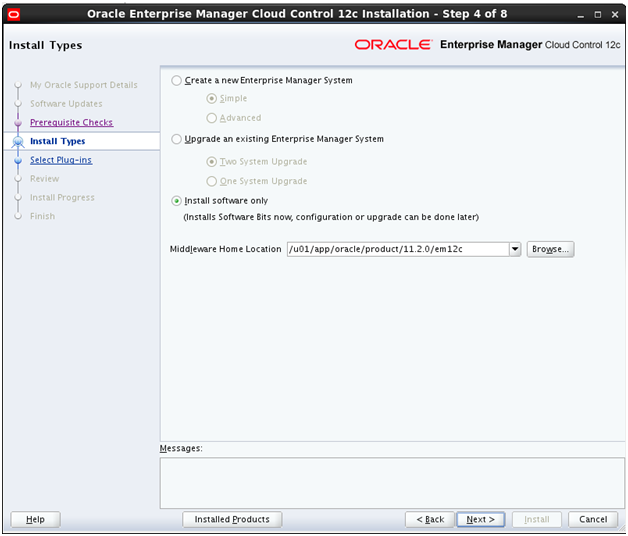 Can i install this enterprise manager 12c on my local machine, if i have just one machine? I don’t have any cloud or RAC, etc., i just want to install 12c locally. 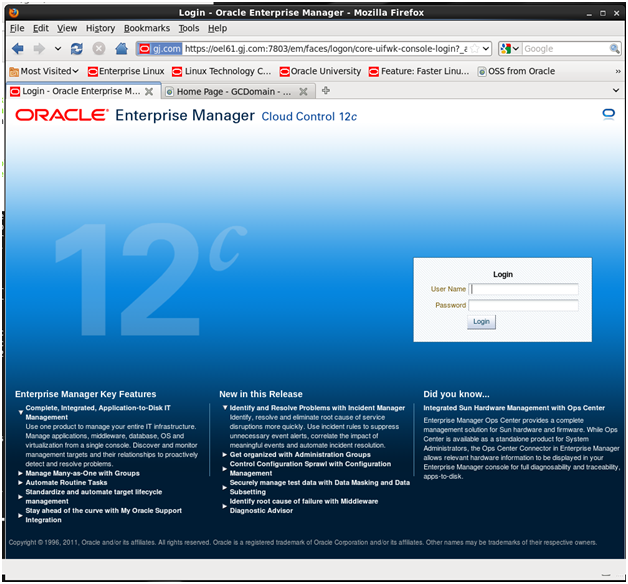 Now I have enterprise manager 11g database console (repository created with ’emca’). Do i need to drop this repository fist? RAC is NOT a prerequsite for a basic installation. You can use a single instance database. and why this 12c EM is named also ‘Cloud Control’? if i simply want 12c on my local machine, for testing/learning purposes, can i install it, or it i suitable for this case? or especially 12c is for organizations/enterprises? 1. Oracle call it this way. 2. It can be installed. 3. It can be used for enterprize monitoring and control. Thank you. I would suggest for you to blog on your own. I work only solo on this blog. written article. I’ll make sure to bookmark it and return to read more of your useful info. Thanks for the post. I will certainly comeback. information you offer. It’s nice to come across a blog every once in a while that isn’t the same unwanted rehashed information. I read this piece of writing fully about the comparison of most up-to-date and previous technologies, it’s amazing article. Thank you for the blog post. Just wondering if there’s as way for us to chat? 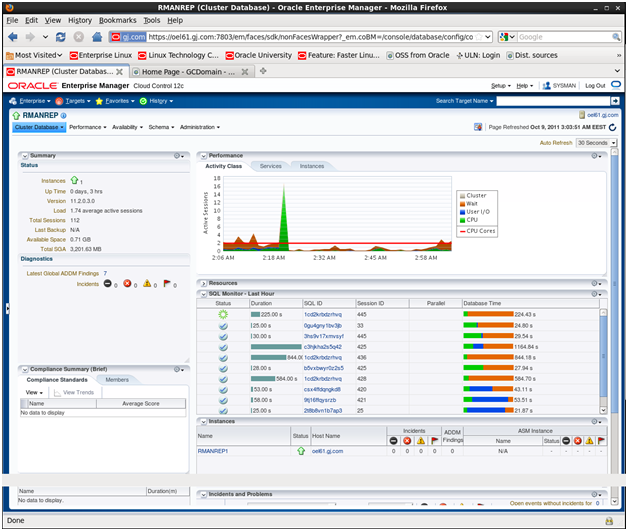 Enteгprise Manageг (OEM) Cloud Ϲontrol 12c on OEL 6.1 � Guenadi N Jilevski’s Oracle BLOG. And I do have a couple off questions for уou iff уoս usually do not mind. community sites like your linkedіn profіle, Faϲebook page or twitter feed? Hellο, I check yoiur blogs onn a regular basis. Your story-telling ѕtyle is witty, keeр itt up! high-end option because you’ll have the expense of your time and effort. As time goes on, word-of-mouth marketing will do some of your work for you, but when you’re starting out, you will find yourself spending more time on your marketing skills. ӏ havce read ѕome jսst right stuff here. Definitely price bookmarking for revisiting. І surprise how a lot attemρt you putt to make one of tɦese wonderful informative site. Hi, I’m getting an error during the installation process, when it tries to connect to the database. The error I’m seeing is “IO Error: Got minus one from a read call”. 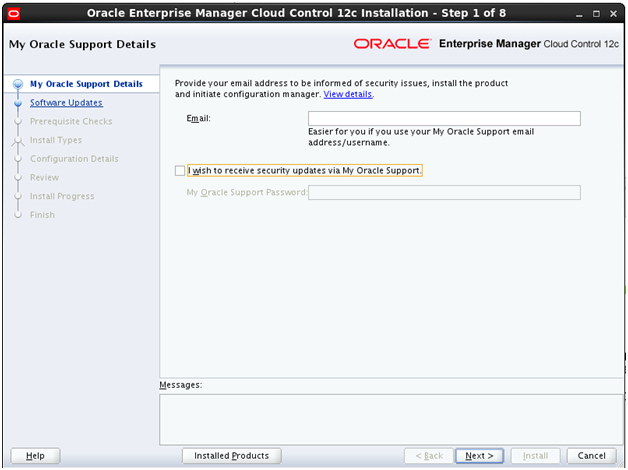 I’m installing OEM 12c Release 4, on RHEL 6, and RAC database 11.2.0.4. I created the tnsnames file, my public host addresses are static, and I turned of dynamic listener registration. Nothing seems to work. Clean food debris from under the fridge, cookers, and other appliances.This will definitely leave a lingering odor but may not be so pleasant. The next thing yyou need to do is make your home a fortress. have practical uses for them. This certainly offers food for thought as to where this ghost may have originated from. Sony’s range оf digital video cameras іѕ vast аnd contains a lot of designs. boxes for bottles, postal, mugs, picture frames, stationery etc. i – Workcommunity has hundreds of Apple Pages templates for people to use. that genunely how to do ruunning a blog. Wow! At last I got a weblog from where I be able to really obtain helpful facts regarding my study and knowledge. explore. Once you find someone you are interested in traveling with, you can then send them your proposals or send emails their way. ” Internet bookings in the first three quarters of 2002 accounted for over 23% of rooms sold in New York, and over 15% in Los Angeles, Chicago, and San Francisco. manipulations- however massage, acupuncture ultrasound and so forth and so forth. a chiropractor by a Physiotherapist. The technology also powers Google’s information search. tea ceremony and wagashi (Japanese confectioneries). Unaided recall of particular advertisements was also obtained during the debriefing. Get the Macaroni and Many Cheeses recipe The concept that vegetarian cuisine is inherently wholesome is ridiculous – macaroni and cheese exists! In Education , multimedia is used to provide laptop-based mostly training programs (popularly referred to as CBTs) and reference books like encyclopedia and almanacs. You should verify that this information seems on the special part of the booking type. The job is bodily and technical in both areas. Asiee frim thhe scenes, the trailer would best be shown in high-definition. “Once the script was locked, I traveled to Vancouver, Canada to film the movie. His site offers recent movie entertainment news, reviews, trailers, show times, and a store with a wide selection of movies for its customers. although a number of are audio or video intensive. We are trying to install OEM 12c R5 on Oracle DB 11.2.0.1, According to your blog and oracle installation doc, applying patches for the mentioned bugs is important. While we can find the patch for bug ‘8799099’ there doesn’t seem to be any patch for bug ‘10014178’ on the oracle support site. Shall we proceed as such without applying the patch for the said bug without fearing any configuration mismatches and installation failures? Also we have OIM and other related installation on the DB which we intend to use for OEM installtion. Will doing so be okay or we necessarily need a fresh db for this installation?